I love hot sauce! Not a meal goes by that I don’t reach for the Tabasco sauce, the Sriracha sauce, or some of the spicy salsa that I have come to love during my frequent trips throughout Mexico — hot sauce capital of the Western Hemisphere. It’s gotten to the point that my food just tastes better when it’s spicy. My friends and family always tell me that hot sauce is going to burn a hole in my stomach, and I’ve been worried that peptic ulcers are in my future if I keep eating so much of the spicy liquid goodness. The good news is, I may not have to worry about that anymore! 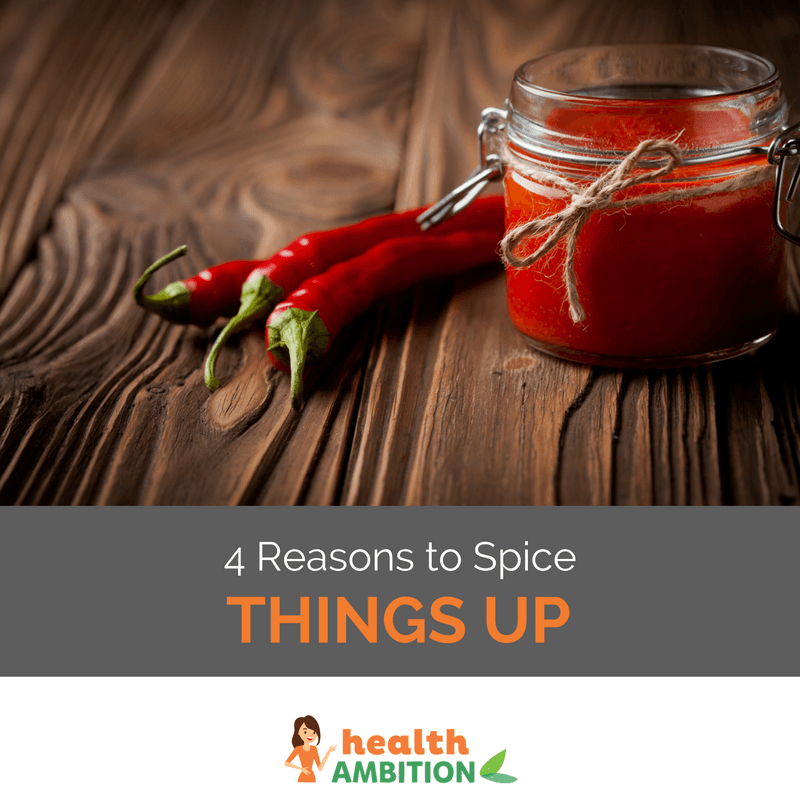 We’ve all heard that spicy food can cause stomach problems, but that isn’t actually the case. While spicy food and hot peppers will cause your stomach to produce more acid, they won’t produce enough acid to eat through your very acid-resistant stomach lining. In fact, chili peppers and hot sauces help to fight stomach problems! How do they do this? They kill bacteria in your stomach. Bacteria can cause all kinds of digestive and bowel disorders, but flooding your system with that spicy red sauce can kill those bacteria before they cause problems. They stimulate the stomach lining. When that spicy chili pepper hot sauce hits your stomach, it stimulates the cells in your stomach lining to produce more of the juices that protects it from the acid breaking down your food! If you already have an ulcer, the hot sauce will make it very painful for your poor stomach. If you are intolerant to chilies or you just have a delicate stomach, irritable bowel syndrome can be the result of eating too much hot sauce. Did You Know: Chili peppers are a great source of vitamin C? They contain more vitamin C per gram than even superstars like lemons and oranges do! Thermogenesis — This is the fancy term for your inner thermostat being turned up a few degrees. By raising your core body temperature, you will continue to burn calories and fat even after you are finished eating. While there is a lot that scientists don’t know about thermogenesis, it is believed that it can make fat burning a lot easier. After all, fat has to cool in order to solidify, so keeping your body temperature high can ensure that the fat is easier for your body to burn! Metabolism Boosting — Studies have shown that vitamin C is one of the best metabolism boosting nutrients around, as it prevent oxidative stress in your body. When your body’s cells are dying off (oxidation) from age, they work more slowly. By preventing this oxidation, you are ensuring that your body can work at proper speeds. The capsaicin in chili peppers will also help to give your metabolism that extra boost that will promote fat burning and weight loss! Mood Enhancing — Have you ever felt that rush you get when you eat really spicy food? Once all of the panting, sweating, and heavy breathing is done, you feel a lot better! This is because spicy foods cause your body to release endorphins, as a study done by the State of New York University at Buffalo showed . When you eat hot sauce, you feel better – once you’ve recovered from the powerful burn of course! Circulation Improving — A number of studies have shown that eating chili peppers can help to improve the health of your heart by stimulating your circulatory system. A press release by Science Daily stated that capsaicin can help to lower cholesterol, reduce hypertension, prevent clots, and make pumping blood a lot easier on your heart! Lifehack: Hot Sauces like Tabasco have some pretty amazing uses! Some people sprinkle it in bird seed to shoo away squirrels, while others pour it liberally on their food to prevent ol’ Fido from eating it. A bit applied to you nails can stop you from chewing on them, and adding them into a fruit salad with some simple syrup can give that fruity goodness a tasty kick! Here’s a video showing the benefits of cayenne pepper. It makes your food taste better. There’s no denying that a dash of hot sauce or a sprinkle of chili pepper can make that tasteless dish a whole lot more enjoyable. It helps you eat more slowly, and eat less. After all, if your mouth is burning, there’s no way you’ll stuff down more spicy or hot food until the pain has gone away. It’s low in calories. The average hot sauce is fairly low in calories – though high in sodium – so it’s a low calorie way to make your food more enjoyable. All this has convinced me that I’m doing right by eating spicy food! The only negatives I can see is most hot sauces have salt in them and eating normal doses is ok, but if you eat too much of it, like i do, it adds up to a ton of salt because of serving size. So I would like to make my own pepper sauce and make it natural without alll the salt and combine different peppers together. Also I like very hot peppers but even the not so hot ones like Serrano’s are very tasty and flavorful. Thank you for your comment. You are right, moderation is the key with hot sauces as well. I agree, I’m a huge Serrano pepper fan. Tasty and nutritious, plus they’re one of the most absurdly anti-inflammatory foods I know of. ive got poisonned by sriracha :/ what must i do??? ive got digestion problem 2 days after eating a big qty of sriracha sauce and its not yet solved: my stomach become really ”hot” and i get to ”vomit” srry for the disgusting subject but i dont know where to look for an antidote anymore…….. plz help me quickly im almost unable to eat anything i try to eat without getting ……. (you know what i mean)….. its still not healed up and its been 2 weeks now that im suffering form this nyan…..
Go to the hospital or doctor! Just top yourself dude it will be easier – I recommend a bullet to the brain you seemingly dont have! How do you know it’s the sriracha? I used to avoid spicy food like the plague due to acid indigestion, but as I have transitioned to healthy non-processed food low in starchy carbs I have found my stomach issues have disappeared and it is true for me that spicy foods no longer cause stomach issues and have become something I always choose when available. Let’s make it hot! Wait a minute! You say it kills the bacteria in your stomach? If you are right as you say then it is doing harm to your heath as everyone else agrees you need bacteria and lots of it to break down the foods to give you the nutritional benefit that everyone needs. You are way off base and are doing harm to people who follow your advice.